Michael McFadyen's Scuba Diving - The Zoo I live in Sydney and as such, it is very easy to dive. It is only 15 minutes from my house to numerous dive sites, all of them very good. This is the same for many divers in Sydney, it is no more than 30 minutes to a dive site for a lot of Sydney divers and no more than 60 minutes for even divers living the furtherest from the coast. Melbourne is very different. Apart from a couple of pier dives inside Port Phillip Bay, it is quite a long drive from the centre of the City to decent dive sites. Melbourne is located on the northern most part of Port Phillip Bay, a huge bay that is at least 56 kilometres long north to south and over 40 kilometres from north-west to south-east (about 80 km east to west). The entrance to the bay from Bass Strait (one of the roughest stretches of water anywhere in the world), is only 3.4 kilometres wide. The entrance is generally known as The Rip. As can be imagined from the name, the water literally rips through on incoming and outgoing tides. Compared to Sydney Harbour which has an entrance 1.6 kilometres wide and has nowhere the amount of water in it, it is like comparing the tides at Broome or Darwin to those in the Solomons. The incoming and outgoing tides are so strong you cannot do a stationary dive while the tide is running and even then it would need to be a slow tide to be able to do a drift dive. In addition, the tide action combined with the ocean swell can form waves across the heads that stand up and form into huge waves, with no backs. Extreme care needs to be taken when entering and exiting Port Phillip Bay. The western side of the entrance is Queenscliff and the eastern side is Portsea. The heads are Lonsdale Point on the Queenscliff side and Point Nepean on the Portsea side. Dive operators run from both locations. The most popular location for starting a dive is the Portsea side as this is more accessible to the larger part of Melbourne. After leaving the Portsea Pier (where at least four or five different dive operations run boats - some with three boats), it is a 10 to 15 minute run to The Zoo. This site is located on the western side of The Rip. The general location is called the Lonsdale Wall and this runs all the way from near the heads to off Queenscliff Beach. I have read that it is at least one kilometre long but I suspect that it is more like 2.5 to 3 kilometres. As mentioned above, The Rip is the channel that runs through the heads. All the ships that enter and leave the ports of Melbourne and Geelong pass through The Rip (there is a big fight on since 2005 about dredging the channel, no idea why when it is deeper than the main channels into and out of Sydney Harbour as far as I can see). Since this site is subject to extremely strong tidal currents, you can only dive here at slack water. This is quite strange as slack water is not actually at high or low tide as you would normally imagine. This confused me no end when I dived here as I knew from looking at a tide table that high tide was supposed to be about 3:45 PM at Portsea. Therefore I assumed that since we were diving at slack water and that this was going to be about 12:20 PM, that it would be high tide at the dive site at that time. This is how it works at places like Swansea Bridge on Lake Macquarie in NSW, the high water at the entrance is about three hours before the start of the main part of the lake. In fact, slack water at Port Phillip heads is about three hours after the high or low tide at the heads. For high tides, slack water at the heads is about the same time that high tide occurs at Williamstown (which is right near the centre of Melbourne city) and about 45 minutes before low tide at Williamstown. Therefore, on the day I dived here (12 February 2005), low tide at Port Phillip Heads was at 9:25 AM and slack water started at The Zoo at 12:20 PM or so. On this day, low tide at Geelong was 12:47 PM and Williamstown was 1:06 PM. When you arrive at the dive location, a small anchor with a couple of buoys is thrown on the dive site. The skipper will then watch the buoys to ascertain when the slack period is about to start. When it is about 5 or 10 minutes away, you will be given the word to gear up. Then, when ready you wait at the stern of the boat to be told to enter the water. Then it is GO! The boat will be close to the anchor line and you swim the short distance to the buoy and descend. There should be no current so this should not be a problem. The top of the reef in this location is about 15 metres at low tide. Once on the bottom, you will notice a couple of things. The first is that the bottom has a lot of kelp. This kelp is much larger than we get in NSW, in fact it is a much sturdier kelp, thicker stems and leaves. The second is that the seabed is composed of a very strange type of rock that forms shapes that sometimes appear to be man made (more about this later). The third is that there are a lot of blue devilfish. These are western blue devilfish. They are found from South Australia to Western Australia but for some reason, there is also a population that is found in Port Phillip Bay and nearby. 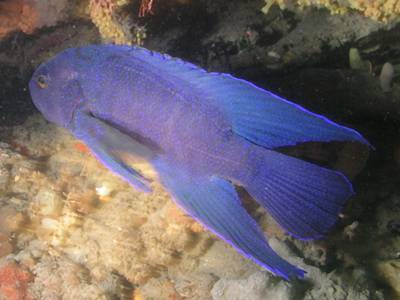 This fish is different from the eastern blue devilfish that is found in NSW (from Narooma to the Gold Coast) in that the eastern blue devil has three light vertical bands on the body and yellow fins while the western blue devil is all blue. From the anchor you head south-east. Straight away you will drop over a small wall to 17 metres and then again to 20 metres. As I mentioned above, the rock on the seabed is very strange. It forms very contorted shapes. 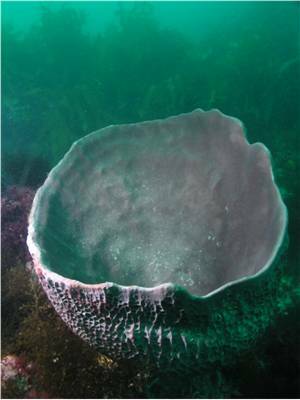 In places the rock resembles breaking waves, in other locations flat topped mushrooms and in one place, it looks so much like the hull of a sunken vessel, even down to portholes and hatchways, that you would swear you have found the wreck of a large cruiser. The rock also forms small caves and overhangs as it drops deeper. 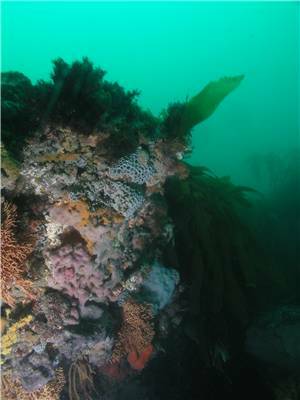 The walls have some very prolific growth, small gorgonias, lots of colourful sponges and sea squirts as well as great lace corals. The caves, cracks and overhangs are home to western blue devilfish. I saw more at this site than I have seen eastern blue devilfish on any dive in NSW (the most I have seen on one dive would be three - here I saw at least seven). This gives rise to the former or alternative name for this dive site of Devilfish Dropoff. The walls keep on coming, each one about two metres high. You go to 22 metres then 24 metres and finally about 26 metres. Along the walls there are lots of luderick, some yellow-striped leatherjackets and lots of smaller fish. Once you hit the 26 metre level, turn to the left and follow the wall. After about 15 minutes on the bottom you will need to start heading back to the anchor area. Turn left again and head back to the south-west or so and once you are at the depth that the anchor was, start searching for the anchor. Once you find the anchor, spend a bit more time looking around. Slack water here lasts for only about 30 minutes. Therefore, you will start encountering a current after about 25 to 35 minutes and you should start ascending about this time. Do not leave it too long. While you start doing your safety stop, the current will have increased and soon the current will be quite strong. On my dive here, at 37 minutes the current was so strong that it was starting to become uncomfortable to hold onto the anchor/buoy line. I again repeat, do not leave it too long or you will need to drift while doing your safety stop and will need to be picked up by the boat. Of course, you should have a safety sausage for this purpose if diving here. The visibility on my dive here was about 15 metres. This was at mid (or low?) tide and about a week after a huge downpour that caused the Yarra River to overflow in the centre of Melbourne and was the most rain to fall in Melbourne in one day in February. I used Melbourne Diving Services and can recommend their excellent service. See my Melbourne Page for more details.